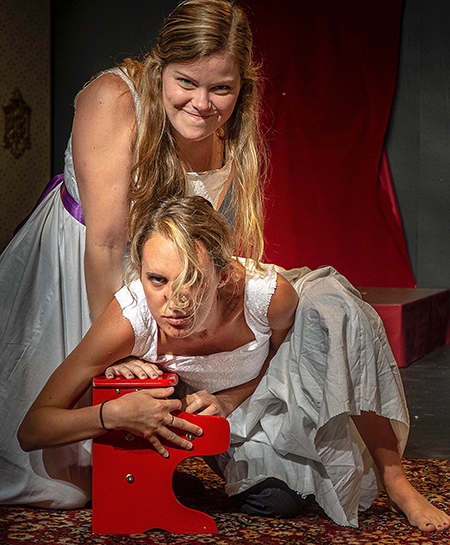 Gabby Dion, top, and Emma Simon pose in a photo from the Pendragon Theatre production of Kate Hamill's adaptation of the classic novel "Pride and Prejudice" by Jane Austen. POTSDAM -- Pendragon Theatre will present Kate Hamill's family-friendly adaptation of Jane Austen's classic novel, "Pride and Prejudice," during an upcoming residency at SUNY Potsdam. The "Pride and Prejudice" performances will be offered on Friday and Saturday, Sept. 14 and 15 at 7:30 p.m., in the Proscenium Theater, located in SUNY Potsdam's Performing Arts Center. Playwright Kate Hamill is well known for her fresh and funny adaptations of Jane Austen's work. According to the New York Times, she "has a gift for condensing three-volume novels into galloping two-act plays. Her screwball 'Pride and Prejudice' hasn't met a rib it can't tickle." The play is centered around outspoken Elizabeth Bennet, played by Amy Stringer, who faces mounting pressure to secure a suitable marriage from her status-conscious mother, played by Pendragon veteran Laura Jean Schwartau. Director Karen Lord-Kirkham describes the play as a romp that both Austen fans and those who have never read the novel will enjoy. Tickets are $15 for general admission, and $10 for senior citizens, youth, and SUNY Potsdam faculty, staff and students. To purchase tickets, contact the Community Performance Series Box Office at 315-267-2277 or www.cpspotsdam.org, or visit the box office, located in the PAC lobby. The Proscenium Theater is wheelchair accessible. There will be no sign language interpreter for these performances.